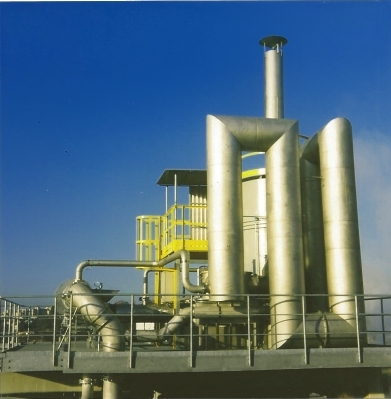 batch processes in a multi-purpose plant. What is a smoothing filter? The smoothing filter acts as a buffer. It is able to store VOCs during times of higher concentrations and release them when the concentration goes down again. The simplest smoothing filter would be an empty buffer volume. The following example assumes a volumetric flow of 1,5 m³/s and a buffer volume of 6 m³. Calculations are idealized, assuming that the incoming gas mixes instantly and completely with the gas in the buffer volume. Three random concentration peaks have been added to the inlet flow. An empty volume fitting 4 seconds worth of volumetric flow, acting as a ripple filter. The passive volume is actually an option: The next photo shows a regenerative thermal oxidation plant for 8000 m³/h STP where the ducts have been enlargened to smooth out the peak caused by bed switching. The capacity for VOC, though, is limited, and this technology is not suited if the peak does not last one second, but several minutes. Thermal oxidation unit for 8000 m³/h STP: Large gas ducts serving as a simple smoothing filter. can release them during low concentration phases back to equilibrium. These can be based on activated carbon or on zeolite. In their most simple form they are simple single adsorbers through which all of the waste gas passes before reaching the proper waste gas purification unit. 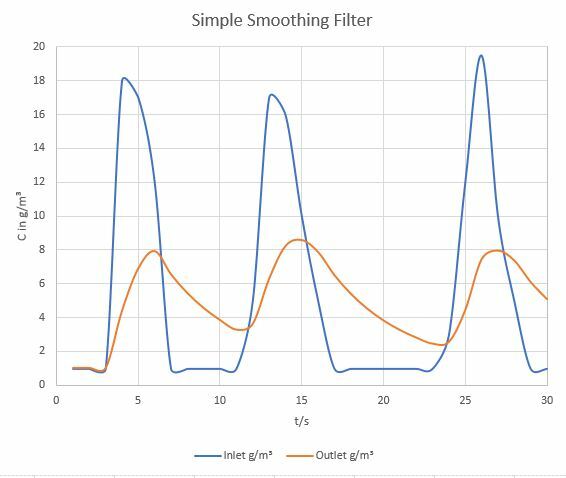 Desorption kinetics are the largest problem in designing smoothing filters: If they do not keep pace, your smoothing filter will eventually overflow. Especially VOC with high adsorption enthalpies, such as esters and substituted aromatics, do not desorb readily without added thermal energy. To calculate the filter numerically is extremely complex, because you do not only have to do the usual calculations of 2n + 2 variables, but your input signal is also not constant. Concentration and composition vary with time. Therefore, modeling-only-approaches usually don’t work. What you need to find out is whether the thermal energy transported into the bed by the diluted gas is sufficient to desorb the concentrated adsorbate with the required speed. For practical purposes this is best done with simple desorption measurements in which a loaded sample is exposed to gas streams of various concentrations, and the exit concentration is measured. From these results it is possible to asses whether a smoothing filter is generally possible. Another basis for a feasibility analysis is the measurement of thermal conductivity of the adsorbent bed, assuming that desorption is a faster process than thermal conduction. Because activated carbons and zeolites have a poor thermal conductivity, this is roughly correct. There is no avoiding at least a larger bench-scale experiment with a test filter which holds a few hundred grams of adsorbent. Since the experiment is set up like the measurement of a break-through curve, this is not so difficult to do. If you get the experimental parameters right, you can scale more or less directly to production size.